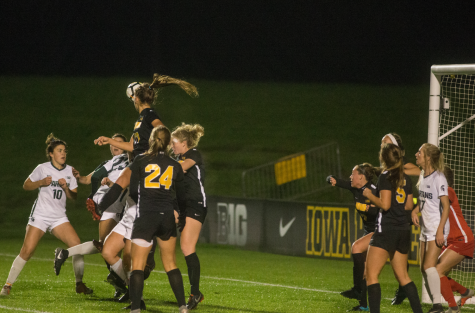 Iowa defends a counter during Iowa's game against Michigan at The Hawkeye Soccer Complex on Sunday, October 14, 2018. 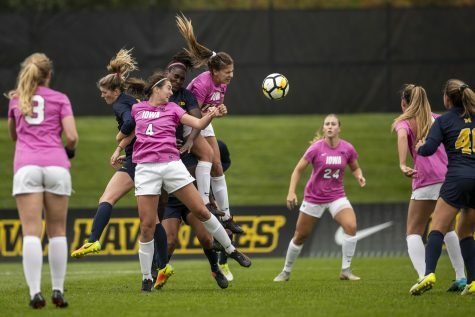 The Hawkeyes defeated the Wolverines 1-0. 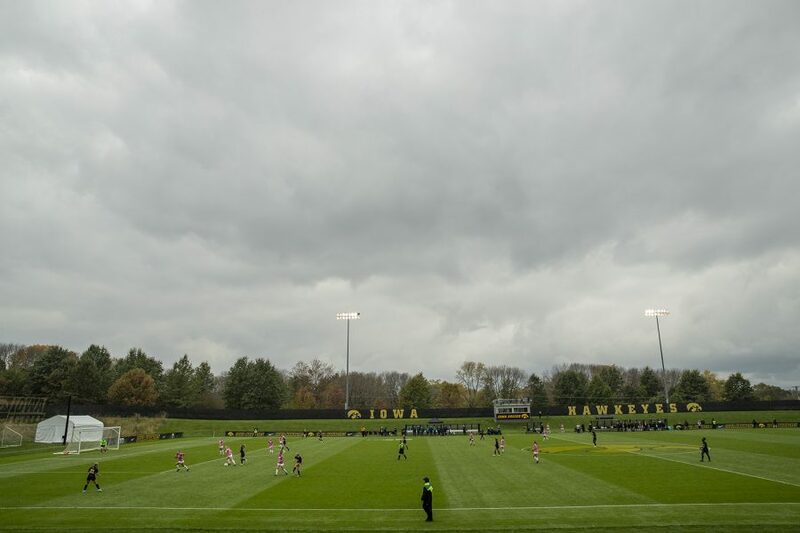 Whistle after whistle rings out, followed by an ecstatic flurry of flying limbs, legs kicking out onto the slippery turf, and an excited yet giddy voice bellowing out 30 yards south toward the center of the pitch. 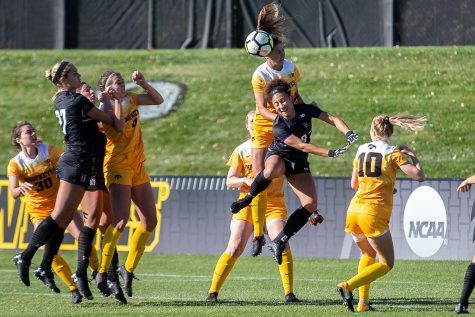 Sweat-drenched players dressed in black and gold make their way toward the sideline exhausted, with a lengthy stretching session in the parameters of a small and deliberate meeting by four figures who have created a small huddle in the center circle of the field. 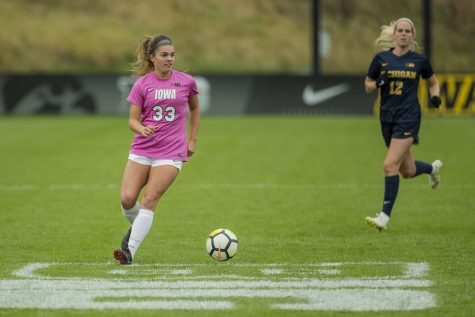 In this meeting stands Katelyn Longino, the latest addition to the Iowa soccer team and the only female coach on the staff. 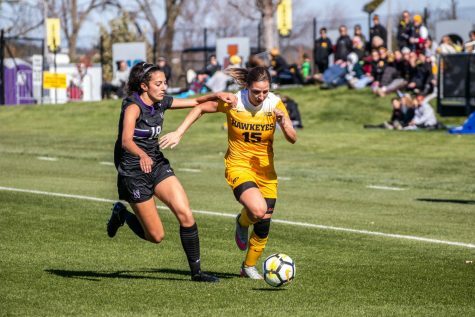 Joining the Hawkeyes only a couple of weeks before the season began, Longino had to adjust to life in a new environment in a hurry, but she became an integral and vocal member of the team through her inspirational mindset and astute coaching knowledge. 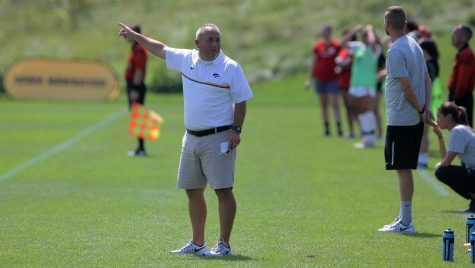 Jones: Speaking about your growth in knowledge through coaching, what style of play do you teach the players, and where is the balance of play style in the Hawkeye staff? 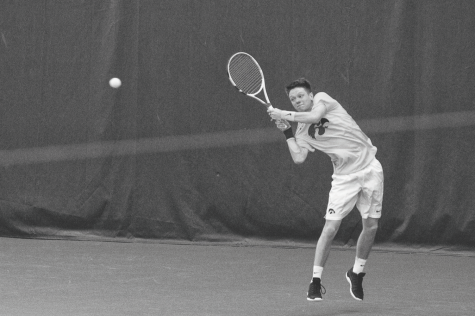 Longino: I’m definitely more attack-minded in my coaching style. I think that is the beauty of working with both [assistant coach] Rade [Tanaskovic] and [head coach] Dave [DiIanni]. Dave is a more balanced figure, while Rade is a very defensive-minded coach, seeing that he was a goalkeeper. I was a No. 10, which makes sense as to why I prefer working more in the attack of our team. It’s a really good balance that you want on your team and on your staff, which is something that we have been able to use to our advantage and grow in both areas. At the end of the day, though, we all have to be a little better on both sides and create a couple more opportunities to help win the team more of the close games. We work very hard and train very well, so the results will come with time, so really our main focus just has to be about putting the ball into the back of the net. 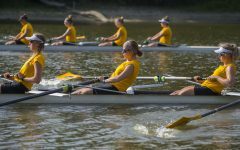 Jones: Giving us a sneak peek into the life of a Division-1 coach at Iowa, what is your daily schedule like? Longino: We are up early around 7 [or] 8 in the morning, prepping and getting ready for practice. Most days our training sessions will be extremely intense and very detailed, lasting somewhere near 2 to 2.5 hours. Afterward, our girls head back to our indoor complex, get some breakfast in them, and go on with their day, resting their bodies and going to class. We as a coaching staff recuperate and get right into film sessions after practice throughout the day, spending a lot of our time discussing our ideas and things that we feel need more attention. 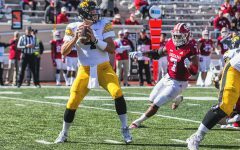 Jones: Given your position as a coach, what is a goal that you have for the Iowa program and its players that you hope to accomplish? 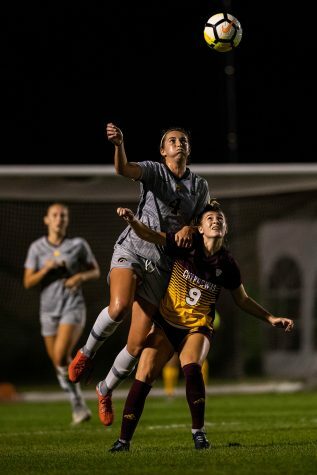 Longino: I think my mission is to encourage people to be the best version of themselves that they can possibly be, whether that be on or off the field. I truly believe that, and I would say that from 2015 to the present, my knowledge and wisdom has given me more of an ability to complete that coaching philosophy, which I think is really important for us. Whether I learn some more tactics to help them on the field or that I get to learn more about leadership to help them take control off of it, it all is a part of what makes our team successful. As I continue to go through my coaching career, my mission and philosophy have continued to really thrive and be a part of who I am and deep down in my soul, what is most important to me is to see players continue to develop and grow into the best that they can be.